It is hard to imagine a rock climbing area with better views. The Riffelhorn sits like the head of a Sphinx on the Gornergrat ridge high above the giant Gorner Glacier. Looking across the glacier is the immense alpine wall of the north faces of the Breithorn, Pollux, Castor and the Liskamm. To the left is Monte Rosa and to the right is the Matterhorn. This relatively small rock peak is the home to many fun, very fun, rock climbs and is a fantastic place to go for both training and to enjoy unhindered movement on steep rock with an unequalled backdrop. 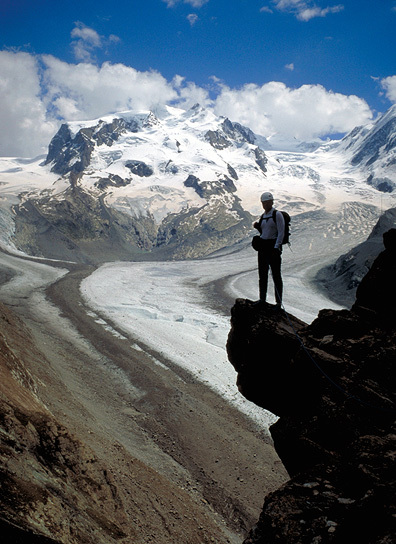 Local guides have used the Riffelhorn as Matterhorn training for decades, teaching their guests good footwork and efficient movement on several of its routes. More recently, however, steeper lines have been put up, bolted for protection, and have become climbing objectives in their own right. Whether you go to train for bigger outings, or for the enjoyment of the day, climbing on the Riffelhorn is always a pleasure. There are many routes on the peak. The easiest is the East Ridge, which, like a giant staircase, alternates steep steps and level sections. The West Ridge is also frequently climbed. 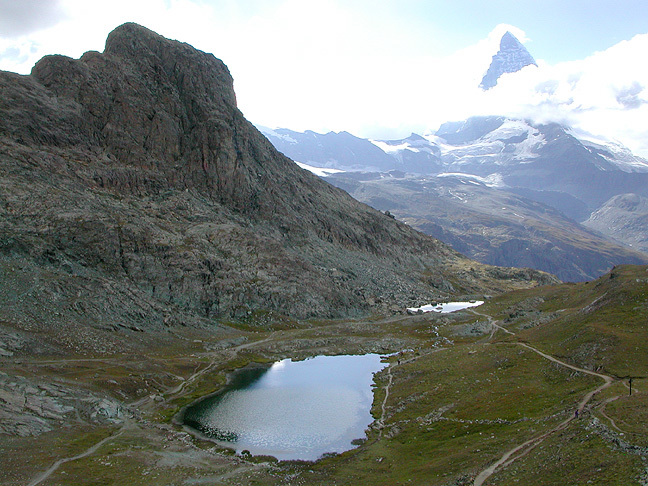 The upper very steep pitch has been equipped with fixed ropes similar to those found on the Matterhorn. 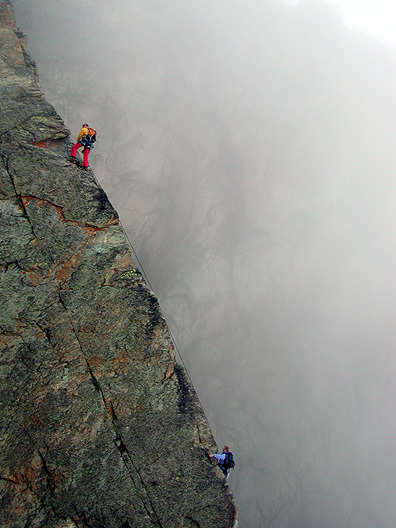 Guides use the West Ridge specifically for training for that ascent. But the South Face of the peak offers the best climbing. Clean, sun-warmed rock with the Breithorn over your shoulder and the Gorner Glacier 1700 feet below you are hard to beat. There are a number of routes on this face, ranging in difficulty from about 5.5 to perhaps 5.9. Some of these are often climbed in mountain boots (with an eye for training) but rock shoes are a better choice for many of them. The climbs are about 6 to 8 pitches in length, long enough to feel like a real climb, but no too long to do in an easy day. Particularly recommended are the routes "Eck" and "Kante". Eck is a bit easier than Kante, and is a good challenge in mountaineering boots. Kante is best done in rock shoes. The approach can't be beat–simply take the Gornergrat railway to Rotenboden and walk an easy 15 minutes to the base of the east ridge. To reach the South Face routes, we rope us and do an easy but occasionally exposed traverse around the south side of the peak to find our climbs. 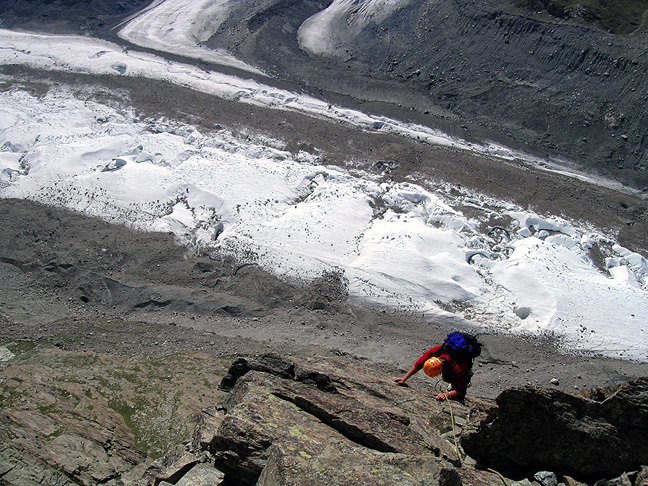 We do the Riffelhorn as a day climb from Zermatt. 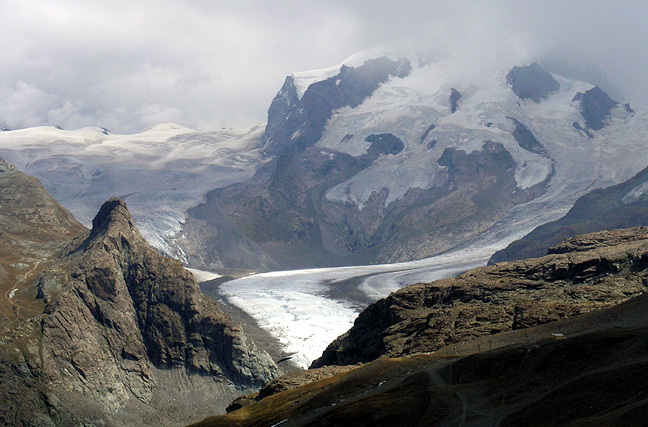 The Riffelhorn is not a big peak. Access is remarkably easy and quick and the routes can be done in a short, relaxed day. The difficulty lies in the technical climbing and this varies from route to route. The harder routes are good for more experienced climbers, while the easier are recommended for beginners. You'll want to be a bit athletic, even for the easy climbs.